A fascination with all things Egyptian has started as soon as ancient sailors became aware of this civilization on the north shore of Africa, and it has not abated for thousands of years. First came Minoans and Mycenaeans, then Athenians and Persians and then Romans and so on. Of course, a lot of this fascination had to do with conquering the fertile and strategically placed land in the Nile delta but it benefited the world culture forever. Ancient Romans had as much fascination with Egyptian culture as Napoleon had about 18 centuries later. Romans expressed that by invading Egypt in 30 BC, with Marc Anthony and Cleopatra being defeated by the future emperor Augustus and wealthy patrons importing obelisks and stone sculptures by the ton. Napoleon’s short campaign in Egypt gave the world a damaged Sphinx (his nose was allegedly used as a practice target by the army), a discovery of the Rosetta stone that eventually to allowed deciphering of hieroglyphs and a science of Egyptology that was a direct result of his bringing over scores of scientists and engineers to study the new land. Its latest manifestation of this Egyptian fascination is evidenced by some major exhibitions that came to Los Angeles this spring. 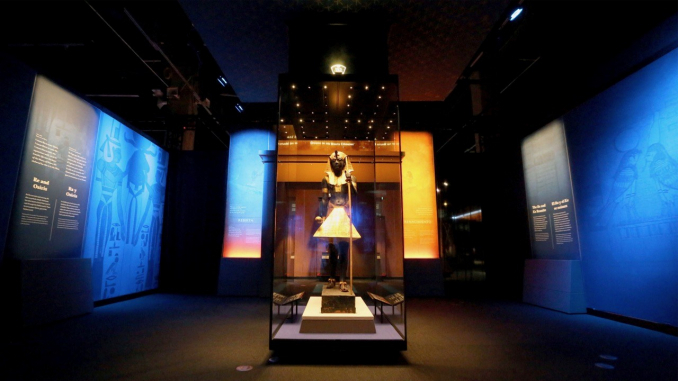 California Science Center is presenting the King Tut showcase, a collection of artifacts from the pharaoh’s tomb that have been continuously touring around the world for decades but this time the show’s collection has been doubled by treasures never seen before. At the same time another LA museum, The Getty Center, has created a major loan exhibition Beyond the Nile: Egypt and the Classical World that examines history and mutual influences between Egypt, Greece and Rome from the Bronze Age through the period of Roman Empire. Exposition Park in Los Angeles is an area that houses several museums, including one called California Science Center that has just opened an international traveling exhibition King Tut: Treasures of the Golden Pharaoh. 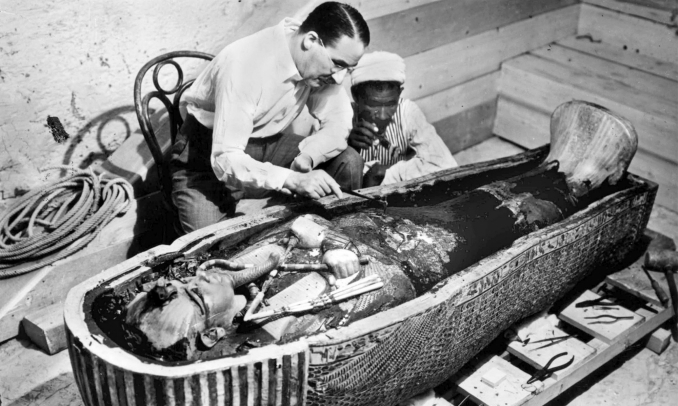 The discovery of the tomb in 1922 is still the greatest archeological discovery of all times, mainly because no other tomb there was found intact with a perfectly preserved mummy as well as all the royal treasures that provided some ground-breaking insight into Egyptian beliefs, clothing and everyday life as well. If one day the tomb of China’s first emperor Huang (who died in 210 BC) is opened, then may be this first place will shift but until now, this is it – the most complete and amazing insight into a specific past culture ever. Under the aegis of the Egyptian Ministry of Antiquities, this tour celebrates an upcoming 100th anniversary of the tomb discovery and while historically this tour has featured about 50 artifacts that would be allowed out of Egypt, this time it has been expanded to about 150 items, most likely for the last time since a new permanent museum is about to be opened. It is a truly a breathtaking display of treasures. Typical museum galleries present cases after cases of important but unimpressive clay figurines or stone fragments of something long gone but half-destroyed. This exhibition is intended to dazzle with every object and it does not disappoint. The 19-year-old Tutankhamun was injured, probably during a hunt, and when he died of infection, he was buried with all the souvenirs of his past (for example an enchanting and exquisitely made wooden chair from his childhood) and all the golden objects he might need in his afterlife. The exhibition focuses on those objects, their significance for religious beliefs and the artistry of craftsmen with limited tools but vivid imagination. There is golden statuette of a ruler standing on a black leopard. Even though it has been buried with Tutankhamun, it may have been made for Nefertiti since the sculpture has feminine qualities. Either way, the leopard was to assist the king in the passage to the underworld. There is a companion statuette of a ruler – this time he should have been standing on a hippopotamus as a personification of Seth, the God of Chaos, but instead the king is standing on a wooden skiff. Since the belief was that all buried artifacts could in fact come back to life with their master, having a hippo come back to life was considered too dangerous. You would think that a leopard was a threat enough but people living along the Nile knew better. When Carter entered the tomb’s antechamber, the entrance path was guarded by two life-size wooden figures striding forward with long staffs. One of these impressive statues is displayed here – an imposing figure with its skin painted black with bitumen to symbolize rebirth and all the clothes gilded. 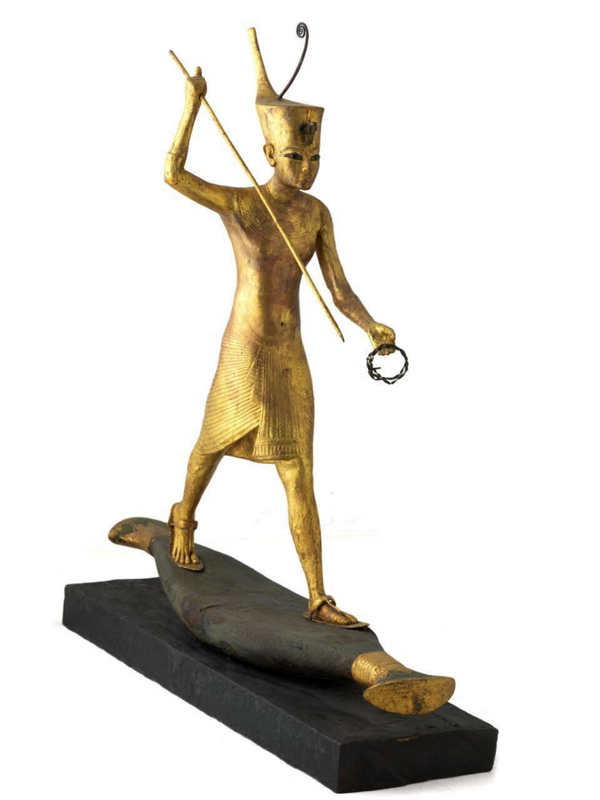 This is a guardian statue protecting the pharaoh’s mummy from all harm and marking his passage to the world of rebirth. There are some surprises in the exhibition, for example a set of beautifully polished boomerangs (who knew that Australia did not have a monopoly on those) and some thin-walled, alabaster ceremonial vessels, including a delicate cup of wishes which was placed at the entrance and ensured that pharaoh’s wish for eternal life was fulfilled. After his death, Tutankhamun’s name was erased by his successors and according to beliefs of the time, the ones whose name is not retained in memory lose their eternal life. Nothing is forever though, so after 3400 years, thanks to Howard Carter’s archeological persistence (and Lord Carnarvon’s money), this the one pharaoh out of hundreds, whose name has been given a worldwide recognition and memory, well beyond any other ruler in the world’s history. Tutankhamun’s name and history have been much trivialized over the last century, to some degree precisely due to this traveling exhibition (check out Steve Martin’s King Tut performance) and his likeness has been rendered worldwide in countless plastic figurines and kitschy Halloween costumes. There is no danger now that his name would be forgotten but this exhibition brings us back to the very source of the world’s fascination with Egyptian iconography and lore – strange graphic styles, deities with animal heads, magical journeys to the underworld, gold and jewel ornaments of unique design and …of course… mummies. The exhibition will move from LA in early 2019 to Europe. The Egyptian antiquities ministry is encouraging people to see it before the exhibition returns home to join other tomb treasures in the new Grand Egyptian Museum scheduled to open this spring on the Giza plateau within the sight of the Giza pyramids. It is designed to be a scientific and archaeological study center of 3,000 years of ancient Egyptian history and a depository of more than 100,000 artifacts. The Getty’s new exhibition Beyond the Nile: Egypt and the Classical World is organized around artifacts that show how Egyptian religion and culture have influenced the Greco-Roman art styles and religious beliefs. The earliest mutual influences started when Minoans sailed from their island (contemporary Crete) and started trading and exchanging diplomatic gifts of statuettes and jewelry. Egyptian goddess Isis became so popular outside Egypt that her images have been produced and prayed to throughout Mediterranean for millennia. Minoan artists, the same who left their astounding frescoes on the walls of Knossos palace in Crete, traveled to Egypt to decorate palaces there. Thanks to this exhibition you can understand how one style springs from the previous style or an artistic concept. After Alexander the Great’s conquest of Egypt in 332 BC, the Egyptian and Greek cultures have merged into a complex amalgamate of the two which is explored at the exhibition in portraits and sculptures that mix the two styles. A typical Greek kouros (a large stone statue of a person standing with one foot forward and hands clenched in fists) turns out to be inspired by and copied from ancient Egypt where such statues, of gods or pharaohs, were a common style of representation. In turn, a Greco-Roman style of funerary portraiture has been widely adopted in Egypt and the exhibition showcases a mummy with a Greek-style portrait painted on it. The Roman occupation in Egypt has resulted in creation of luxury goods created for Italian villas – mosaics depicting an idealized life on the Nile and sculptures of Roman gods and people in Egyptian headdresses.